Can you expect decent project-studio performance from monitors costing under £300? Photo: Mike CameronThe ESI Near08 Experience is a two-way, rear-ported, active monitor priced to meet the needs of the home-based project-studio owner. It's distributed in the UK by sample giants Time + Space, and represents their first foray into studio hardware. 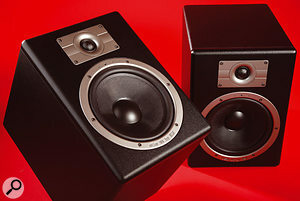 The monitors are built around a Kevlar-coned eight-inch bass/mid driver, partnered with a ferrofluid-cooled, neodymium-powered, one-inch, soft-dome tweeter. They're built into economically constructed hi-fi-style cabinets, made from black vinyl-laminated MDF, and measure 358 x 255 x 322 mm. The speakers weigh 10kg each, making them suitable for stand or shelf mounting, and the drivers are symmetrically positioned, so the right and left speakers are identical. The cabinet edges are slightly rounded, which not only looks better than sharp edges but also helps reduce cabinet-edge diffraction. All the connections and controls, including both TRS jack and XLR balanced inputs, are fitted to the metal rear panel, which also acts as a heat sink for the amplifiers, and the cabinet tuning port is also at the back. Rear porting has the advantage of diminishing port noise caused by turbulence, but it does mean that the speakers need to be set up at least a few inches from the wall behind. 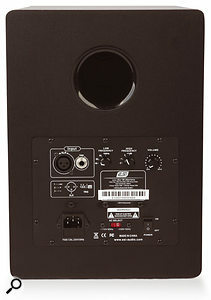 I couldn't see any internal cabinet damping material through the port, and tapping the bass-driver cone produced a definite note somewhere in the kick-drum range, which is usually a sign that speakers will exhibit a degree of low-end overhang, making bass sounds seem more full than they actually are. The two internal amplifiers are rated at 70W each, and the system claims an impressive frequency response of 40Hz to 24kHz, though no maximum SPL is quoted. Both drivers are magnetically shielded by means of field-cancelling magnets, and the amplifier circuitry includes RF filtering, subsonic filtering, output current limiting and over-temperature protection, as well as the usual mains-panel fuse. While the designers claim that the use of Kevlar is a major improvement over the paper and polypropylene drivers used in other products, it is interesting that the designers of many other highly acclaimed speakers still swear that doped paper sounds the best, as it has good self-damping properties — there's really no general agreement within the industry as to the ultimate cone material (in fact, Fostex make their high-end driver cones out of bananas!). Certainly Kevlar, a key component of bullet-proof clothing, is both strong and light in weight, and manufacturers such as KRK have been making extensive use of it for many years. The metal rear panel doubles up as a heatsink, as well as providing high and low frequency controls and a master volume.Photo: Mike CameronThe manual states that the crossovers have been designed to give the flattest possible frequency response (though no crossover details are provided). Some designers take the position that it is more important to achieve a flat phase response, and that small irregularities in the frequency response are less objectionable than the phase errors created by using filters to flatten peaks or dips in the cabinet and/or driver response. Ultimately, all you can do is use your ears to see what really works. The Near08 Experience monitors also include a degree of frequency-response adjustment, via a control on the rear panel. A rotary switch allows the high-frequency (HF) level to be adjusted over the range -2 to +1dB in 1dB steps, though I left it set flat for my tests. 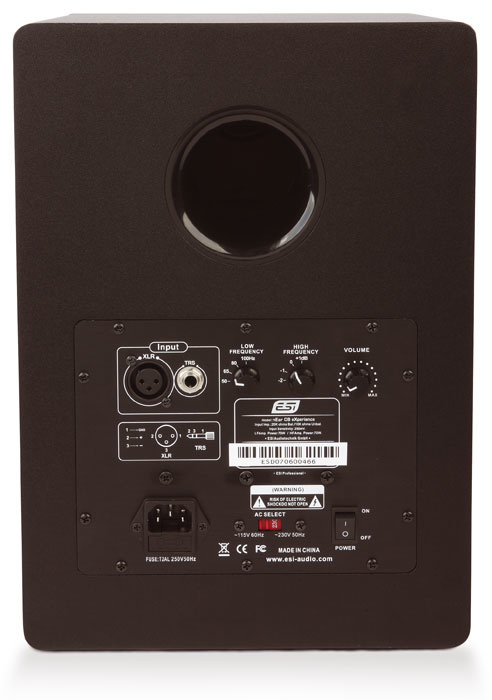 A low-frequency 'boost' rotary switch (with settings of 50, 60, 85 or 100Hz to match the room and mounting position) is used to adjust the low end, and this may also be useful when teaming the system with a subwoofer, such as ESI's own SW10K. There's no explanation of what this switch actually does, but from listening it sounds to me like a switchable high-pass filter, which can be used to restrict the bass extension in smaller rooms (the term 'boost' may be misleading). Mains power comes in via the usual IEC socket and the adjacent power switch, and there's an AC selector for 110V or 230V AC operation. The blue LED set into the woofer mounting ring indicates when the speakers are powered up. After wheeling out all the usual test tracks and mixes, I soon got a pretty good idea of how these speakers behave. Firstly, although no maximum SPL is quoted, they are capable of playing back at very high volumes, while still remaining clean and punchy. Tonally, I found that at the flat setting I chose for my initial test they were noticeably bright and splashy, verging on the aggressive — in a blindfold test I would have sworn I was listening to titanium tweeters rather than soft domes. No doubt those into NS10s and the like will find this perfectly acceptable, but I quickly began to find it fatiguing and reset the HF switch to its -2dB position. This helped — I felt the sound was still on the forward sound of neutral but it was no longer so aggressive. The low end also turned out to be better behaved than I'd expected from the cone tapping test I described earlier, and though it was a little unfocused it didn't dominate proceedings, and seemed well balanced against the mid-range, with a convincing degree of depth. The stereo imaging was also fine (though not exceptional) and the overall sense of detail and clarity was good. It must be borne in mind that these are far from expensive monitors, and once you've made the necessary HF adjustments and found the best position for them, they actually turn in a very decent performance, with lots of bass extension for use in a typical project studio. They are a little forward-sounding for my personal taste, but I know lots of engineers who think that this is how a good monitor should sound — and it would certainly be no problem doing good mixes on them after first having got used to them by auditioning a range of good-quality commercial recordings. There are only three or four other monitors that perform well in this price range, and the Near08 Experience models deserve to be taken seriously alongside them. 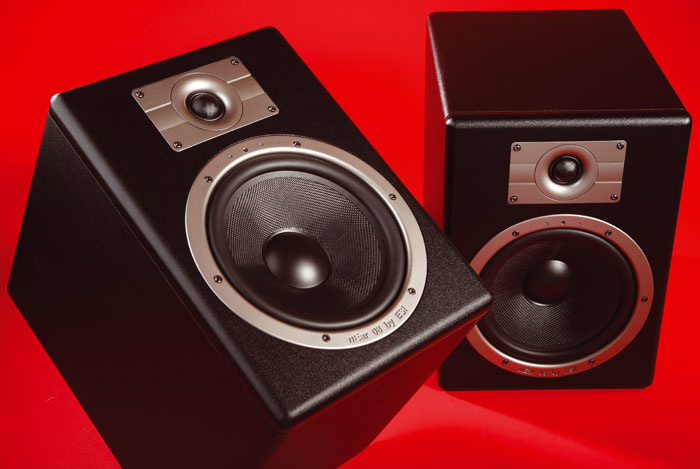 If you're considering these monitors and want to audition alternatives, you could look at models such as the Alesis M1A MkII, the Samson Rubicon, Fostex's PM6A and the Tannoy Reveal Active. May be too aggressive-sounding for some tastes. These monitors deliver surprisingly good sound quality and at generous SPL levels, given the price. They definitely have a forward character, but many people seem to like that sound. £266 per pair including VAT.